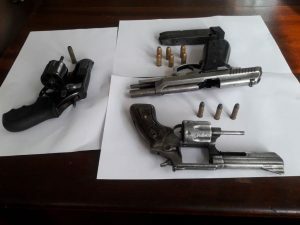 A 16-year old boy is among three persons arrested by police for allegedly being in possession of three guns. Police said the teen was suspected to have perpetrated an armed robber. The Guyana Police Force said law enforcement agents in ‘C’ Division arrested the trio from Sophia. The items seized are one .40 Taurus Pistol with six live rounds, two .32 Special Revolvers with four live rounds and 79 grams of cannabis sataiva. “One of the three persons arrested, is 16 years old and is being investigated for an alleged robbery under arms committed on a resident of the Sophia last (Thursday) night.